I don’t mind cold weather. I don’t have a problem with snow. I can even handle icy roads. But when all of the above are combined with FOG, I start to get a bit depressed. That is exactly what I see when I look out my window, icy fog. It settled in yesterday and is supposed to hang around until at least Sunday. Of course, one reason I am depressed is because the weather results in me spending too much time indoors where I spend too much time in front of my computer where I spend too much time reading about the confederacy of dunces we call the Idaho State Legislature. 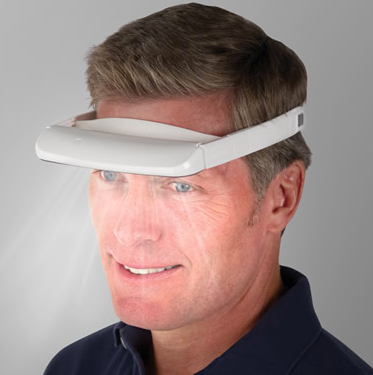 I don’t actually own the “light therapy visor” shown above. But, I am tempted to try it. That is one thing that happens when I start feeling a bit “down”, I start grasping at visors. I wonder, does anyone have experience with “happy lights”? Do they really work? Actually, I really don’t plan on ordering the visor because, even with Amazon’s two day delivery, the worst of the weather will be over by the time it gets here. After all, today is groundhogs day and Punxsutawney Phil did not see his shadow, which means we will have an early spring. So, to get me through the weekend, I turn to what has always been “mood altering” for me- music. The National Rifle Association’s president David Keene ended Friday’s news conference—the gun lobby’s first public comments since the massacre in Newtown, Conn.—with these words: “This is the beginning of a serious conversation. We won’t be taking questions today.” Shoot first and never answer questions. That pretty much sums up the news conference. The NRA’s spokesperson, Wayne LaPierre, who delivered the NRA’s message, was defiant and defensive, blaming, Hollywood, the media, video games that no one plays anymore, the lack of a mental health data base, and, at base, a corrupt, lawless society where the only hope in case of an emergency is to arm yourself (the only thing that will stop the bad guys with guns is a good guy with guns). Blaming everyone and everything except the NRA’s refusal to consider any sort of gun control legislation. His “serious solution” was calling for security officers to be stationed at every school. LaPierre spoke with an edge to his voice and a look in his eye that was frightening. The response has been amazing. The headlines from the two New York newspapers demonstrate that the news conference was a PR blunder of massive proportions. Let us hope the politicians who have been in the gun lobby’s pocket will begin to see the NRA for what it really is, a fringe group of loonies. Lisa Long, a writer and single mother from Boise, wrote an article for the BSU on-line magazine, The Blue Review, that has gone viral on the internet. Anyone who has a relative, friend, or knows anyone related to someone with mental health issues the same or similar to those of Lisa’s son empathizes with her situation and, given the lack of adequate care for children (and adults) coping with mental illness, realizes her sense of helplessness. Parents like Lisa are forced to put their children into the criminal system before they are able to get any help. When I asked my son’s social worker about my options, he said that the only thing I could do was to get Michael charged with a crime. “If he’s back in the system, they’ll create a paper trail,” he said. “That’s the only way you’re ever going to get anything done. No one will pay attention to you unless you’ve got charges. Unfortunately, not everyone has empathy for Lisa and other parents like her. Yesterday she was forced to go on national television and defend her article. According to Kathie Garrett, a former legislator and current chair of the Idaho Suicide Prevention Council, Idaho ranks near the bottom for Mental Health Care funding. We want to see more awareness so people understand people with mental illness are no more dangerous than the rest of the population, especially when they have availability to good mental health services,” said Garrett. But that access to mental health services can sometimes be tough to come by. NAMI says fewer than one-third of people with mental illness receive treatment. Garrett says that can be attributed to the stigma associated with mental illness, and also, recent cuts in funding. Idaho ranks near the bottom in the nation for mental healthcare funding. Garrett tells us she understands budgeting and the tough economic times. But she believes getting that care to people who need it, when they need it, is worth the money. When it comes to the Idaho State Legislature, Lisa’s cries for help fall on deaf ears.